Salpeter celebrates prematurely with one lap remaining. IT WAS A day to forget for Lornah Chemtai Salpeter at the European Championships on Sunday evening, as the Kenyan-born athlete fell just short of a podium finish in the women’s 5,000m after stopping with a lap to go. The 29-year-old, representing Israel, was in firm control of second place coming into the final stretch after a brilliant sprint finish alongside Sifan Hassan at the Olympiastadion, but bizareely slowed down after crossing the line on the penultimate lap. Her lapse in concentration allowed Yasemin Can (Turkey) and Eilish McColgan (Great Britain) to take advantage. With Salpeter’s momentum drained following her premature celebration — believing to have secured a silver medal — she failed to recover and placed fourth, failing to make the podium. 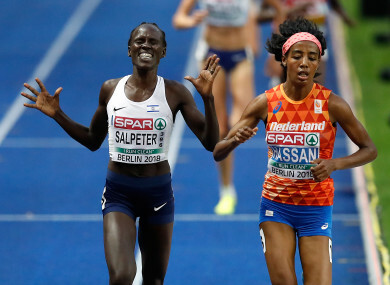 Salpeter had previously claimed gold in the women’s 10,000m on Thursday evening and looked certain to contest first place in the 5,000m before her error. Hassan maintained her form to take the gold medal for the Netherlands with a Championship record of 14:46. Email “One lap to go! Embarrassment as Salpeter denied women's 5,000m medal after early celebration”. Feedback on “One lap to go! Embarrassment as Salpeter denied women's 5,000m medal after early celebration”.